Unlike many other of the company's models, the Image Advanced 3000 treadmill seems to be a remarkable improvement in quality and style…for a price. With more features than some cars, it’s hard to turn away from the Image Advanced 3000. UPDATE: Due to its lack of popularity, ICON Fitness is no longer making Image treadmills. 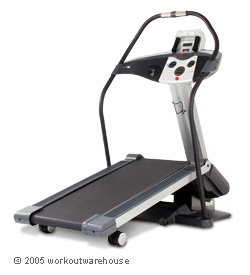 Take a look at NordicTrack, the company's most popular brand, for similar treadmills. Image treadmills are often criticized for their poor quality parts and substandard function, but the Image Advanced 3000 treadmill is a step above the rest. With the 30% incline range, most of the work of the treadmill is being done by gravity, allowing the treadmill itself to work less and last longer. However, it’s not just the design that’s causes experts to take a second look at the Image Advanced 3000, but also the features. 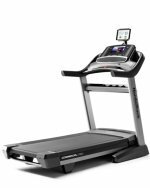 The commercial drive motor, impact reducing cushioning system and quiet running treadbelt make this one of the most comfortable treadmill rides on the market without sacrificing power along the way. For those who are interested in increasing their current fitness level, the Image Advanced 3000 treadmill offers a lot of extras that will keep every workout fresh and new. Users appreciate the easy-to-use (with a little help from the owner’s manual) and simple to access features. Users appreciate the variety of the 23 built-in workout programs which ensure continued motivation. What sets the Image Advanced 3000 apart from other treadmills is the upper body workout arms with digital resistance. Fitness buffs say they can get a full body workout without having to buy an extra piece of equipment or add more time onto a workout. Experts agree that the digital resistance technology allows this feature to be both useful and effective. With all of the great features and the smoothest ride yet on Image treadmills, it’s hard to keep your eyes on anything else but the Image Advanced 3000 treadmill. However, the hefty price tag of about $1600 just might cause you to think twice. While you are getting what you pay for, this is really a treadmill that serious athletes and exercisers should invest in – a beginner might want to hold off on making a significant purchase like this.